When most people think of boating, they think of relaxing, carefree days out on the water, but the truth is that in some cases boating can be anything BUT relaxing. Boating is just as dangerous as driving, if not more so because fewer rules regulate how boats operate on open water. For instance, while boat operators show “common courtesy,” they are not required to drive on the left or right side of, say, a lake. Moreover, boats can cut back and forth at will, so long as they keep a vigilant eye out for other vessels in the area. Unfortunately, common courtesy is not enough to prevent boat accidents. According to the U.S. Coast Guard, boating accidents resulted in 651 deaths, 3,000 injuries, and roughly $38 million in property damage. Many of the 4,000+ accidents that occurred could have been prevented. Alcohol Use: Boaters are subject to the same laws regarding operating and drinking as the drivers of vehicles are: they must maintain a BAC of below .08. Operating with a BAC of above .08 is a criminal offense. That said, not enough people take these boating laws seriously, and it is not uncommon for boaters to load up their coolers with beer and liquor before launching. Unfortunately, alcohol has the same effects on people out on the water as it does on land, and it contributes to far more boating accidents than should be necessary. Distracted Driving: Distracted driving is just as big of a problem out on the water as it is on the road. According to the Coast Guard, boater inattention is the number one contributing factor of boating accidents. This is because operators go into vacation mode along with the rest of a boat’s occupants, which is fine when the boat is in park, but a real hazard when it is in gear. Operator Inexperience: Boat operators need not only understand how to operate a boat, but the laws regulating the open water. It would not hurt for boat operators to take a boater education course to familiarize themselves with safety regulations and procedures. 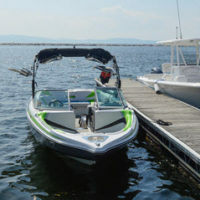 Improper Lookout: This problem occurs both when the boat is in operation and when people engaging in water sports fall off a board or inflatable tube. Both the driver and anyone else appointed as lookout are responsible for keeping an eye on the boat’s surroundings, as failure to do so could result in serious injury or even death. Speeding: A lot of boat operators view the open water as a runway on which to test their vessels’ speed and power. While this is perfectly acceptable on truly open water, it can be dangerous and downright reckless on busy lakes, bays, lagoons, and other populated bodies of water. Reckless Operating: In addition to speeding, alcohol use, distracted driving, and improper lookout, there are other ways in which boaters can be considered negligent. For instance, a boat owner may disregard the boat’s capacity and allow one too many people on board. A passenger who had one too many adult beverages may fall overboard without a life vest. An over-confident skier may jump out of the wake without checking over his or her shoulder to see if another boat was coming up from the rear. Boating accidents may not all be the same, but often times, the contributing factors are. With the right precautions, those precautions can be eliminated and therefore, accidents avoided. If you were involved in a boating accident in Miami, reach out to the lawyers at Spencer Morgan Law as soon as possible. Our legal team can investigate the cause of the incident and determine who can be held liable for your injuries. We can also negotiate with the at-fault party’s insurance company on your behalf to ensure the best possible outcome. Contact our team today to get started.